The use of Comfrey also known as knitbone as a herbal balm is legendary. 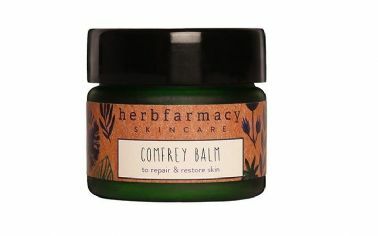 This wonderful organic balm from Herbfarmacy provides excellent value for money. The use of Comfrey as a herbal balm for cuts and bruises is legendary. It can also be used as an excellent pollen barrier when applied around the nostrils – a fact now adopted by a well-known brand of balms for hayfever sufferers. *Helianthus annuus (Sunflower) seed oil, *Simmondsia chinensis (Jojoba) seed oil, *Cera flava (Beeswax), *Butyrospermum parkii (Shea Butter),*Symphytum sp. (Comfrey leaf and root) extract, *Rosmarinus officinalis (Rosemary) extract, *Lavandula angustifolia (Lavender) essential oil.